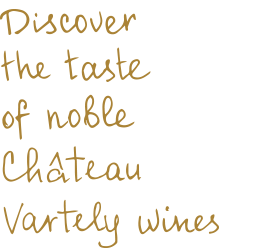 The Château Vartely company operates two interconnected divisions: the first one is the winery itself and the second one is the wine tourism complex, both being of the national importance. Château Vartely aims to grow into the jewel of the wine industry in Moldova, and consequently become the country’s premier tourist destination. The winery’s total vineyard surface area is 260 hectares, of which 150 ha are situated in the central part of the country, IGP Codru, and the other 110 hectares located in the Bugeac region in the South of Moldova, IGP Valul lui Traian. The Château Vartely winery is equipped with state-of-the-art winemaking equipment that guarantees the highest quality results during the grapes processing, wine storage and bottling. At the core of winery operation lies the closed technological cycle: from cultivation of own grapes, their processing, production and maturation of wine, to bottling and supply to the market. White grapes: Chardonnay, Muscat, Sauvignon Blanc, Traminer, Feteasca Regala. Red grapes: Pinot Noir, Cabernet Sauvignon, Merlot, Rara Neagra, Malbek, Feteasca Neagra, Syrah. The state-of-the-art equipment, purchased from the leading German and Italian manufacturers, provides a processing capacity of 4000 tons of grapes per season. The winery therefore houses 2 automated lines for grape processing and 2 bottling lines with a capacity of 1500/3500 bottles per hour. To this extend, the high level of automatization of major winemaking operations ensures the consistency and ongoing quality improvement of crafted wines.